An excerpt from How to Free Your Mind: The Practice of Tara the Liberator by Venerable Thubten Chodron, published in 2005. Before you, sitting on a lotus, is a beautiful woman with a body of green radiating light. Who is she? What is Tara? Why do practitioners of Tibetan Buddhism meditate upon such a being? How can a spiritual relationship with her enrich our lives? How can the radiance of Tara’s qualities illuminate our own path? What can Tara, the liberator, help us become? Tara can be understood on many different levels. First, she is a historical figure, a person who generated bodhicitta—the altruistic intention to attain full enlightenment in order to benefit all living beings most effectively—and then actualized that intention by becoming a Buddha. Second, she is a manifestation of awakened qualities, and third, she is our Buddha potential in its future, fully purified and evolved form. A meditator may alternate between these understandings, using them as needed to cultivate his or her good qualities. Many eons ago in a different universe, a princess named Yeshe Dawa lived. Based on her own investigation and experience, she came to have great confidence in the Three Jewels—the Buddhas, Dharma, and Sangha. She understood the unsatisfactory nature of cyclic existence and thus determined to be free from all sufferings. Thinking that all living beings were like her in wanting happiness and not wanting suffering, Princess Yeshe Dawa developed genuine, impartial love and compassion for each and every living being. She was not enchanted by the luxuries of palace life; instead, she vowed to show the way to liberation to millions of beings each day before eating breakfast, to millions more before eating lunch, and to even more before going to sleep at night. Because of this, she was called Arya Tara (Tibetan: Pagma Drolma), meaning “The Noble Liberator.” “Arya” indicates that she has directly realized the nature of reality and “Tara” shows her liberating activity. When religious authorities suggested that she pray to be born a man in future lives, Tara refused, pointing out that many Buddhas had already manifested in male bodies and vowing to attain full awakening in a woman’s body and continuously return in female form in order to benefit others. Be we men or women, this historical Tara is a role model for us. Just like us, she was once an ordinary being with problems, stress, and disturbing emotions. But by training her mind in the Buddha’s teachings, she attained full awakening, the state of complete freedom from all defilements and of total development of all good qualities. Likewise, if we practice the Dharma with joyful effort, we too can attain her state. Smiling at us, Tara says, “If I can do it, so can you!” thus encouraging us along the path. In this story, we again see Tara as a person, although she had a miraculous birth. This legend can inspire us not to lose faith in the arduous practice of benefiting beings. Such patience and perseverance are necessary, for as we know, ignorant beings such as we are at present often do the opposite of what would bring happiness and peace. Tara’s optimism gives us strength in difficult situations through showing us that suffering always has the possibility of being overcome. A second way Tara can be understood is as a manifestation or embodiment of enlightened qualities. A Buddha’s mind is beyond our limited perceptual or conceptual abilities. All those who are awakened practiced for eons in order to purify their minds and enhance their capabilities in order to benefit us. But they need a way to communicate with us to lead us on the path out of suffering to full awakening. Since we are embodied beings who relate to color, shape, and other objects of the senses, the compassionate Buddhas appear in various forms in order to communicate with us. Tara, like all other meditational deities, is one of those forms. Each deity is a manifestation of the same enlightened qualities—love, compassion, joy, equanimity, generosity, ethical discipline, patience, enthusiasm, concentration, wisdom, and so forth—although each manifestation may emphasize a particular quality. For example, Tara symbolizes awakened activity, while Avalokiteshvara embodies compassion. Among the diverse forms of Tara, Green Tara, who will be described below, eliminates obstacles and brings success. White Tara counteracts illness and bestows long life. Among the 21 Taras and the 108 Taras, each has her own specialty, symbolized by her color, implements, and physical posture. In another way of speaking, Tara is an emanation of bliss and emptiness. Within the sphere of emptiness—the absence of inherent existence—the blissful wisdom realizing emptiness appears in the form of Tara. By appearing in this physical form of Tara, the minds of bliss and emptiness of all the Buddhas inspire us to cultivate constructive attitudes and actions. By understanding the symbolic meaning of Tara’s physical characteristics, we gain confidence in and are moved to follow the path she teaches, generating her qualities within ourselves. Her female form draws us into spiritual life. My teacher, Lama Thubten Yeshe, who practiced Tara meditation daily, often referred to her as “Mummy Tara.” Just as most of us worldly beings feel affinity for our mothers and rely on their constant, compassionate help, we are naturally attracted to Tara. We can relax in her presence and look at ourselves honestly, knowing that Tara will not judge, reject, or abandon us due to our shortcomings. Like any mother, she sees her child’s potential—in this case, our spiritual potential or Buddha nature—and wants to nurture it. We feel that we can easily entrust ourselves to the path she teaches. In this way her female form functions to increase our confidence in the Three Jewels and to feel supported in our practice. Her female form represents wisdom, the essential element needed to remove the ignorance which misconstrues reality and is the root of all our suffering. Women tend to have quick, intuitive, and comprehensive understanding. Tara represents this quality and consequently can help us to develop such wisdom. Thus she is called “the Mother of all the Buddhas,” for the wisdom realizing reality that she embodies gives birth to full awakening, the state of freedom from narrow, dualistic discriminations and its attendant, self-centeredness. 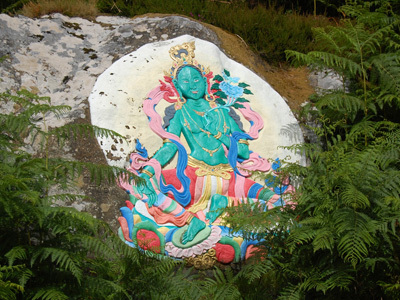 Green Tara’s color symbolizes activity and success. Although she possesses the same qualities as all other manifestations of the omniscient ones, she specifically embodies the enlightening influence by which the Buddhas act to benefit and guide us. Also, she represents the purified aspect of the element of air, which activates growth in the world. Just as the air element generates the growth of green plants, which consequently brings the uplifted spirit of springtime after the dreariness of winter, Tara’s enlightening influence makes our good qualities bloom and leads us to the freshness of liberation after the oppression of cyclic existence. Lush green plants that grow easily are a farmer’s delight. Similarly, her green color represents success—in worldly affairs as well as in spiritual development—giving us a sense of delight, hope, and optimism. Aspirations made in the presence of Green Tara may easily grow into results, and requests made to her may be actualized quickly. One reason for this is that by visualizing and praying to Tara, we are energized to create causes for happiness and to eliminate interferences in our Dharma practice. Tara’s body is made of light. Transparent, it appears and yet is intangible, like a rainbow, mirage, or illusion. In this way, her body represents the compatibility of the two truths: conventional and ultimate. On the conventional level, Tara appears and exists. Yet when we search more deeply for her ultimate mode of existence, we cannot find anything that exists inherently, independent from causes and conditions, parts, and term and concept. Tara conventionally appears, like an illusion, but ultimately cannot be found and is empty of an inherent essence. Tara’s body language expresses her inner realizations and outer activities. She doesn’t sit with her head down or with her arms crossed in front of her chest, as we do when we are closed or unhappy. Rather, her “dancing posture” is relaxed, open and friendly. Her outstretched right foot indicates her readiness to step into the realms of suffering, confused beings in order to help us. Due to her altruistic intention, Tara can appear in these realms without being adversely affected by the environment. She doesn’t shy away from suffering, but faces it fearlessly and compassionately, thereby counteracting it. Her left leg is tucked in, demonstrating that she has full control over her subtle inner energies. No matter whether others praise or blame her, harm or help her, her energy is not pushed off balance and she does not lose her equanimity. Tara’s right hand in the gesture of granting sublime realizations shows that by following the path we can attain these realizations ourselves. This gesture is also called the gesture of generosity, symbolizing her willingness to give material possessions, love, protection and the Dharma to all beings according to their needs and their dispositions. Her left hand is in the gesture of the Three Jewels, with the thumb and ring finger touching and the other three fingers stretched upward. These three fingers represent the Three Jewels. They indicate that by entrusting ourselves to these three and practicing their teachings, we can actualize the unity of compassionate bliss and wisdom, symbolized by the joining of her ring finger and thumb. Thus extended outward, Tara’s right hand and foot emphasize compassionate activity—the method aspect of the path to awakening. Her left hand and foot, which are closer to her, indicate her imperturbable inner peace, gained through practicing the wisdom aspect of the path. On Tara’s crown is Amitabha Buddha, peaceful and smiling. As Tara’s spiritual mentor, he represents the importance of having a fully qualified, wise, and compassionate guide on the path. By keeping her mentor on her crown, Tara is ever-mindful of the teachings she has received from him. In this way we are reminded to do the same. While we ordinary beings decorate ourselves with external ornaments in order to look beautiful, Tara’s inner beauty—her tranquility, compassion, and wisdom—are her real adornments. Her dazzling jeweled necklaces, armlets, anklets, earrings, and tiara indicate that the six far-reaching attitudes or paramitas—generosity, ethics, patience, joyous effort, concentration, and wisdom—are fully integrated in her being and decorate her every activity. Tara is also adorned with three syllables: an om at her crown chakra, ah at her throat chakra, and hum at her heart chakra. These three syllables embody respectively, a Buddha’s physical, verbal, and mental faculties. They also represent respectively the Sangha, Dharma, and Buddha Jewels of Refuge. These syllables serve as subtle objects upon which a meditator may focus and also remind us of the qualities we are developing within ourselves as a result of practicing the Buddha’s teaching. In this way, each characteristic of Tara’s form illustrates the path to Buddhahood and its resultant qualities. A Tara sadhana—a text describing a guided meditation—begins with taking refuge in the Three Jewels and generating the altruistic intention of bodhicitta. Contemplating these, we clarify our spiritual direction and our motivation for following it. We then visualize Tara in front of us and cultivate positive attitudes through practicing the seven-limb prayer. The first limb, prostration, purifies pride and cultivates respect for an awakened one’s magnificent qualities, thus opening ourselves to develop those qualities. The second limb, making offerings, involves offering real and imagined beautiful objects. This purifies miserliness and cultivates delight in being generous. The third, revealing our mistakes, purifies denial, justification, rationalization and other unhealthy psychological machinations that prevent us from being honest with ourselves. Revealing our errors cultivates honesty and humility. The fourth, rejoicing in our own and others’ virtues, cuts jealousy and develops delight in the goodness and attainments of others. The fifth and sixth limbs, requesting the Buddhas and our spiritual mentors to remain in our world and to teach us the Dharma, purify any harm or disrespect we may have had towards them and help us to appreciate their presence in our lives. The seventh, dedication, shares the positive potential from the above practices with all beings and dedicates it for their temporary and ultimate well-being. The sadhana continues with verses praising Tara’s qualities and requesting her inspiration for our spiritual practice. These verses, recited while we visualize Tara in front of us, focus our attention on Tara’s enlightened qualities. The more we reflect upon Tara’s qualities as we meditate, the more we can give and receive the happiness that comes from following the spiritual path she taught. The verses help us give voice to our noblest spiritual aspirations, and by doing so, we are energized to actualize them. The heart of the sadhana—the dissolution into emptiness and the self-generation—follows. Tara now comes on top of our head and dissolves into green light which flows into us and merges with our heart-mind in our heart chakra. At this point we meditate on selflessness, the emptiness or lack of independent or inherent existence. That is, there is no solid “me” meditating, no concrete Tara to meditate on, and no findable action of meditation. All false appearances of inherent existence cease and we rest our mind in the ultimate nature. Within this empty space which is free from all false, dualistic appearances, our wisdom mind appears in the form of Tara, with a body made of radiant green light. Still aware of the absence of an independently existing “I,” we simultaneously label “I” in dependence on the appearance of Tara. Having neither a solid conception of self nor the selfishness that it engenders, we nevertheless can have the sense of being Tara and envision performing a Buddha’s enlightening activities to benefit all beings. In our mind’s eye, we imagine feeling the impartial love and compassion for all beings that Tara feels and having her skillful means to be able to benefit them. From our Tara body made of light, we emanate countless small Taras that go throughout the universe, touching each sentient being, becoming what they need and alleviating their suffering. All sentient beings’ defilements are purified and they gain all of Tara’s realizations. Now that all beings have become Tara, we radiate offerings to them that generate in them bliss uncontaminated by attachment. Then all these Taras fall like snow flakes into us, blessing and inspiring our mind. Like a child who dresses up and pretends to be a fireman, thereby inspiring himself to become one, we imagine ourselves to be a Buddha who relates to people as a fully enlightened being—without ignorance, hostility, or clinging attachment and with immeasurable wisdom, compassion, and skill. In this way, we train our mind to think and act like a Buddha by bringing the Tara we will become in the future into the present moment and imagining being that Tara. This plants the seeds for us to actually become Tara in the future. Identifying ourselves with our Tara nature, we gain invigorating confidence that spurs us to make our life meaningful. The visualization of performing Tara’s enlightening activities is often done while reciting her mantra, om tare tuttare ture soha. A mantra is a set of Sanskrit syllables uttered by a Buddha when in deep meditative equipoise on the nature of reality. We recite a mantra in order to calm our energies, concentrate our mind, and approach a state of meditative equipoise. In Green Tara’s mantra, om represents Tara’s body, speech, and mind, the faculties that we want to develop. Tare, tuttare, and ture all have the meaning of “to liberate.” In one interpretation, these liberate us from the obstacles to generating the paths of the three levels of practitioner—initial, intermediate, and advanced. In another, they banish the obstructions to generating the three principal aspects of the path—the determination to be free, the altruistic intention, and the wisdom realizing emptiness. In a third mode of interpretation, tare means liberating from cyclic existence, that is, from uncontrolled, continuous rebirth with a body and mind under the influence of ignorance. Of the Four Noble Truths, tare liberates from the first noble truth, true suffering. Tuttare indicates liberation from the eight dangers, which will be discussed below. Thus tuttare liberates us from the second noble truth, true origins of suffering—afflicted attitudes and emotions and the contaminated actions they motivate. Ture liberates from disease. Since the most severe disease we have is the afflicted attitudes and emotions as well as the subtle obscurations on the mind, ture indicates the third noble truth, true cessation of suffering and its origins. Such liberation is our ultimate purpose and is true spiritual success. This is arrived at through practicing the fourth noble truth, the path to awakening. Soha means “may this come about.” It indicates planting the root of the path to full awakening in our hearts. Om to the transcendent subduer, Arya Tara, I prostrate. To the sound soha I pay great homage. Briefly, this is the way that Tara sadhana guides our mind on the path to full awakening. As practitioners progress and realize the altruistic intention, single-pointed concentration, and insight into the nature of reality, their spiritual mentor will instruct them in more advanced visualizations and meditations to purify their extremely subtle body and mind. They will be able to use these in wondrous ways to benefit all beings. Tara liberates us from eight external and eight internal dangers. While the eight external ones threaten our life or property, the eight internal ones endanger us spiritually by turning us away from the path to awakening. How does Tara protect us? The real protection is the Dharma refuge—the true paths and true cessations of sufferings and their causes in our mindstream. To cultivate and then perfect these we must first study them, then reflect on their meaning, and finally familiarize ourselves with them in meditation and in daily life. To accomplish these three steps, we must depend on a teacher; it is in this way that Tara guides us. First she teaches us the Dharma, and then she stimulates us to investigate its meaning so that we reach a correct understanding. Finally, she guides us in meditation practice so that we generate actual realizations rather than mere fantastic experiences. Awakened beings cannot take our defilements away like pulling a thorn from someone’s foot. Nor can they give us their realizations like pouring water into an empty bowl. Rather, the real help they give is by teaching us the path to awakening, the Dharma. The following eloquent verses requesting Tara to protect us from these dangers were composed by the First Dalai Lama after he had completed a meditation retreat on Tara. They point out obstacles in the path so that we will investigate and understand how they operate in our mind. Then we can apply the antidotes that the Buddha taught to first subdue and finally eradicate them so that they never reappear in our mind. The lion of pride—please protect us from this danger! As spiritual practitioners, one of the greatest dangers we can fall into is being proud. Many sad and damaging scandals involving spiritual practitioners have been unearthed in recent years, and in many of these, someone arrogantly thought he had reached a level of attainment that in fact he had not and then engaged in unethical actions. Just as a lion struts in mountain forests, our pride dwells in the environment of wrong views about the nature of the “I” or “self.” Whereas the “I” is dependent, we apprehend and then grasp at it as existing independent of all other factors. This wrong view is the root of our suffering in cyclic existence. Holding an unrealistic view of how we exist, we compare ourselves with others. We become puffed up and proud over those who are inferior, jealous of those superior, and competitive with equals. Our pride begets contempt that is like a lion’s claws with which we injure other living beings. These harmful actions perpetuate our rebirth in unfortunate states of existence. Meanwhile, pride itself prevents us from recognizing our horrible predicament in cyclic existence because we arrogantly think we are flawless. Thus we fail to practice the Dharma and consequently develop no new good qualities while the ones we have deteriorate. The wisdom realizing the emptiness of inherent existence is the ultimate antidote to all eight inner fears, for it sees the true nature of the self—that it is empty of any permanent or independent existence. However, since this realization takes time to generate and is difficult to gain, in the meantime we use easier antidotes corresponding to each particular affliction. In the case of pride, one such antidote is to contemplate a difficult topic, such as the twelve sources and eighteen elements. “What are those?” we may ask. But that is the point: these topics, while essential for actualizing the path, are difficult to understand. Recognizing how limited our current understanding is decreases our pride and makes us more humble. Another antidote to pride is reflecting that everything we know and every talent and ability we have comes from the kindness of others. If we are a good athlete, we have our parents and coaches to thank. Our artistic or musical talent blossomed due to our teachers who cultivated it. Even something we take for granted, such as the ability to read, comes through the kindness and efforts of so many others. So how can we be proud, thinking that we have good qualities because we are someone special? In asking Tara to save us from this danger, we are actually calling upon our inner Tara—the seeds of our own wisdom and compassion. As these qualities gradually grow, they protect us from the damage our pride can inflict upon ourselves and others. The elephant of ignorance—please protect us from this danger! Powerful, yet out of control, a mad elephant terrorizes all in its path. It destroys crops cultivated with much care and endangers the lives of many. Similarly, in our daily life our uncontrolled mind becomes involved in many unethical actions, and when we sit down to meditate, it is unable to focus and runs crazily from one object to another. This occurs because our mind has not been subdued by mindfulness and introspective alertness, mental factors that hook it so it remains focused on what is important. In the context of ethical behavior, mindfulness is aware of the guidelines within which we want to live and introspective alertness checks us to see if we are living within them. In the context of meditation, mindfulness remembers the object of meditation so that we remain on it and cannot be distracted to another object, while introspective alertness investigates whether our mindfulness is active, or whether distraction or dullness have set in, interfering with our meditation. When our mind is intoxicated by ignorant attachment to sense pleasures, we do whatever we need to do in order to get the pleasure or advantage we seek, even if this entails piercing others with our tusks of flagrant harm. In addition, ignorance takes us down wrong paths that lead us to more confusion and suffering instead of to awakening. By petitioning Tara for protection, we are calling forth our own powers of mindfulness and introspective alertness. Like a wise elephant tamer who fearlessly knows how to subdue a wild elephant and harness its energy for constructive purposes, these two mental factors lead us to a non-violent lifestyle and to deep concentration. Mindfulness is developed by repeatedly recalling our ethical guidelines and our meditation object, and introspective alertness arises from frequently checking what our mind is occupied with. If our mind is focused on something conducive to the path, introspective alertness lets it be; if it is not, introspective alertness calls forth the appropriate antidote to calm whatever ignorant emotion plagues us at that moment. The fire of anger—please protect us from this danger! Anger is compared to fire because of its power to destroy quickly and indiscriminately the positive potential, harmony, and trust among people that have been cultivated with great effort over a long period of time. Like a raging forest fire, anger begins with a tiny spark, and fueled by the wind of inappropriate attention that focuses on and exaggerates the negative qualities of someone or something, anger flares up. Blazing, it produces tumult in our own and others’ lives by leading us into cloudy misconduct. Amidst the obscuring smoke of our harmful actions, we cannot see the source of our difficulties and thus do nothing to extinguish the fire of anger. Under the influence of hatred and rage we harm ourselves as well as others. As Dharma practitioners we have tried to engage in constructive actions (positive karma) that leave positive imprints on our mindstream. These imprints produce happiness in our lives as well as fertilize our mind so that crops of spiritual realizations will grow. However, anger burns positive imprints, rendering them impotent. Thus anger scorches not only the victim of our destructive deeds—another living being—but also the perpetrator—ourselves. Patience, the ability to remain internally calm in confront of harm or suffering, is the antidote to anger. Patience does not mean passively giving in or foolishly condoning harm. Rather, patience calms our mind so that with clarity and wisdom we can consider various courses of action and choose one that will bring the most benefit and least harm to everyone in the situation. With patience, we are able to act firmly—sometimes with peaceful strength, other times with assertive compassion. The snake of jealousy—please protect us from this danger! Jealousy, like other disturbing emotions, stems from ignorance of the nature of reality. It ignorantly makes us think we’ll be happy if we destroy others’ happiness. Like a vicious snake whose venom kills a healthy person, jealousy poisons the happiness and goodness of both ourselves and others. While we say, “Love thy neighbor as thyself” and “May all beings be happy,” when someone else has good fortune that we don’t—even if we didn’t have to lift a finger to bring about their happiness—our jealousy cannot endure their prosperity, ability, or virtue. Under its influence we try to demolish others’ happiness and success. Such behavior is self-defeating, because even if we succeed, we do not feel good about ourselves when we undermine others’ well-being. Thus spiteful jealousy not only lessens our own self-respect, but also keeps us bound in pain. Like a snake killing its victim by constriction, jealousy wrings the life out of our mental peace. Sometimes only the pain of the jealousy itself stimulates us to seek out its antidotes. Rejoicing in the happiness, talents, fortune, and good qualities of others is that antidote. When others are happy, we might as well join in! When others act wisely and kindly, why not rejoice in their virtue? Rejoicing is regarded as the lazy person’s way to create great positive potential. When we rejoice at others’ virtues—their kindness, generosity, ethical discipline, patience, joyous effort, concentration, wisdom, and so forth—we accumulate positive potential as if we had that admirable attitude or done that beneficial action ourselves. Since we need to accumulate great positive potential to progress along the path, rejoicing at others’ goodness and happiness is definitely worthwhile. It spurs us along the path to awakening and also makes us happy right now. The thieves of wrong views—please protect us from this danger! When we have treasured possessions that bring us prosperity and joy, we want to protect them from thieves. Similarly, we must take care that our accurate views on important spiritual matters are protected, because these are the foundation of our spiritual prosperity. Should we follow wrong views, we will engage in seemingly spiritual practices that purportedly lead to awakening but actually do not. Thus we will be left impoverished, stranded in a spiritual desert. Spiritual poverty is more dangerous than material poverty for it affects not just the happiness of this life, but the happiness of many future lives as well. The thieves of wrong views are of many varieties. Some wrong views believe that unethical actions are ethical and that misconstrued practices lead to enlightenment. Distortion of religious teachings, such as thinking that killing infidels leads to rebirth in heaven, creates a fearful world both in society and within those who hold such views. The chief wrong views, like barren wastes in which no liberating activities grow, hold to the two extremes: absolutism and nihilism. The former reifies the way in which phenomena exist, while the latter negates their existence totally. While all persons and phenomena are empty of independent existence, absolutism holds that they exist independently. It sees phenomena as possessing their own inherent essence and existing under their own power, whereas they do not. Nihilism goes to the other extreme, believing that persons and phenomena do not exist at all. It thus disparages the functioning of cause and effect, thus destroying our conscientiousness in practicing constructive deeds and abandoning harmful ones. When absolutism or nihilism is present, we are unable to understand either ultimate nature or the conventional nature of phenomena. The Middle Way view is the balance that is needed. It negates all fantasized ways of existence, including independent existence, but affirms that all persons and phenomena do exist. That is, although everything lacks independent existence, it exists dependently. This view enables us to distinguish accurately between what exists and what doesn’t and between what to practice and what to abandon. In this way, our collections of wisdom and positive potential—towns and hermitages of ease and bliss—are protected, and our happiness ensured. The chain of miserliness—please protect us from this danger! Although ignorance is the root of cyclic existence, what keeps us locked in the cycle of suffering from one lifetime to the next is craving. In cahoots with craving is miserliness, the mind that clings to our possessions and can’t bear to part with them. While we like to think of ourselves as generous people, when we examine our behavior, there is much room for improvement. For example, our closets and basements may be filled with things we don’t use—in fact, we may not even remember having some possessions—but should we begin to clean out our storage areas, our mind concocts many reasons not to give these things away, even to people who clearly need them. “I may need it later,” “This has sentimental value,” “The people I give it to will take advantage of me and ask for more,” “I don’t want to appear as if I’m showing off by being generous,” and on and on. Fear often lies behind our excuses. We falsely believe that possessions will bring us security in cyclic existence. In fact, our attachment to them keeps us bound in a prison of dissatisfaction. We constantly crave more and better, yet are never satisfied with what we have. Non-clinging and generosity are the antidotes. With non-clinging we don’t conceive of material possessions as a reliable source of happiness or as the meaning of success. More balanced within ourselves, we find contentment, a rare “commodity” in our materialistic society. Contentment allows us to cultivate the love that wishes others to have happiness and its causes, and thus we take delight in giving. Giving with an open heart brings us joy and directly benefits others. Goods are then shared more equitably within our society and among nations, soothing the ill-feeling of social inequity and promoting world peace. Sharing is a source of our continued existence as a species. As His Holiness that Dalai Lama says, it is not survival of the fittest, but survival of those who cooperate the most, that makes a species prosper. None of us exists independently; we have to depend on others simply to stay alive. Thus helping others and sharing wealth benefits both self and others. Generosity makes us happy now, enables our species to continue to prosper, and creates positive karma that brings us prosperity in the future. The flood of attachment—please protect us from this danger! Like a flood, attachment sweeps over us, propelling us helplessly in the stormy ocean of cyclic existence. It does this in two ways. First, under the influence of attachment, which clings to persons, objects, places, ideas, views, and so forth, we act in harmful ways in order to get what we want. Our destructive actions create conflict with others now and leave imprints on our mindstream that produce suffering situations later. Second, at the time of death, attachment arises once more and we cling to our body and life. When we realize we cannot hold onto them any longer, attachment then grasps onto another body and life, and we are reborn in cyclic existence. In each rebirth, aging begins immediately after we are born, sickness occurs repeatedly, and death is their inevitable outcome. In the meantime, still swept along by the flood of attachment, we continue to act destructively, leaving more negative karmic imprints on our mindstream that cause yet more rebirths as we drown in confusion and unhappiness. Crossing the torrent of cyclic existence is difficult. We need guidance to do this, a star by which to navigate to find our way across the dark seas of the disturbing emotions. The Sanskrit word tara means “star,” from the root meaning “to guide across, to carry across.” We ask Tara to protect us from danger by teaching us the path to liberation and full awakening, by which we cross over to the other shore and arrive at a state of mental bliss and freedom. Contemplating the transient nature of things is an excellent antidote to attachment. Seeing that the objects to which we cling change moment by moment, we know that they will not last long and thus are not reliable sources of happiness. Turning away from their deceptive lure, we focus on transforming our disturbing attitudes and emotions and developing beneficial ones. Through the process of familiarizing our mind with the compassionate motivation of bodhicitta and the wisdom realizing emptiness, we progress through the stages of the bodhisattva path to Buddhahood. The carnivorous demon of doubt—please protect us from this danger! Doubt is of various types, not all of them obstructive. When our doubt is a form of curiosity that propels us to learn, examine, and clarify the meaning of a teaching, it aids us on the path. However, when our doubt dwells in confusion and leans towards wrong views, our mind spirals in circles of its own making and we are spiritually immobilized. This deluded doubt devours our time, squandering our chance for liberation; it resembles a carnivorous demon that destroys life, cutting short the blossoming of a person’s potential. A mind spinning in doubt cannot go straight on the path to liberation. If we start to do a practice, we doubt its efficacy; when we listen to teachings we doubt their authenticity. We doubt our ability to practice; we doubt the ability of our teacher to guide us; we doubt the path to practice; we doubt the existence of enlightenment. Unable to reach any resolution, we cannot go forward on the path and our mind remains tormented. Our ultimate aims, liberation and enlightenment, are slaughtered by this demon of doubt. To counteract doubt, we must first stop the flurry of contradictory thoughts and calm our mind. Meditation on the breath is an excellent way to dispel discursive thought and focus the mind. A settled mind can distinguish important issues that need consideration from skeptical, nonsensical thoughts. Next we must learn to think logically and clearly so that we can investigate these issues and reach accurate conclusions. For this reason, Tibetan monastics spend years debating and discussing the scriptures. The formalized structure of debate teaches us how to examine the teachings clearly and test their validity. It also draws out deeper meanings of the teachings, shows us what we do and don’t understand, and elucidates diverse perspectives. Although we may not engage in formal debate, discussing topics with Dharma friends serves the same purpose. In this way we can clarify what we believe, and having done that, we can begin to practice accordingly. And other conducive conditions as we wish! Through doing the Tara practice and applying the antidotes to the eight dangers in order to benefit all beings, we have created tremendous positive potential. We now dedicate it, directing how it will ripen, for two principal purposes. The first is for all beings to be free from conditions that impede our practice and the integration of Dharma with our own mind. Such conditions may be external, such as war, poverty, excessive obligations, or lack of a qualified spiritual guide, or internal, such as disease, emotional turbulence, doubt, or mental incapacity. Second, we dedicate so that we and all others will meet conditions conducive for actualizing the path to awakening. Long life is important so that we can study and practice the Buddha’s teachings for a long time. Positive potential enables us to die without regret and propels us towards fortunate rebirths in which we can continue our spiritual practice. It also fertilizes our mind so that we will understand the meaning of the Buddha’s teachings easily and be able to integrate them into our live. Material wealth provides us with necessities so we can practice without worry. It also allows us to share possessions with others, thus accumulating positive potential from generosity. Spiritual wealth enables us to contact a qualified spiritual mentor and good Dharma friends who encourage our practice. Glory can refer to the ability and conditions to help other skillfully. Plenty is the sense of richness that allows us to give our material possessions as well as to share our love, protection, and Dharma understanding with others in a skillful way. Although the above verses are phrased in the manner of supplicating Tara to protect us from the various dangers, we must remember some important points in order to understand their meaning correctly. First, Tara is not a self-existent, independent deity or God. Like all persons and phenomena, she exists dependently and is empty of independent or absolute existence. We should avoid thinking of Tara as an external being who can wave a magic wand curing our difficulties and fulfilling our selfish desires while we sit back and relax. Instead, we make these requests with an awareness that we (the one making the request), Tara (the one we are requesting), and the action of requesting are all empty of independent existence, yet exist conventionally. Second, although all beings who have become Tara are free from limitations from their own side to helping others, they are not omnipotent. They can teach, guide, and inspire us only to the extent that we are receptive. One of the purposes of reciting these and other similar verses is to open our mind and heart, making ourselves receptive spiritual vessels. Although we seem to be praying to an external Tara, we are invoking our internal wisdom and compassion through generating wonderful aspirations and directing our thought towards virtuous aims. The more we open our hearts with love and compassion to all beings equally, the more Tara can affect us. The greater our wisdom understanding the ultimate nature, the more Tara can inspire us to deepen our realizations. Download a PowerPoint presentation of Tara and the eight dangers she protects us from. To do the Tara practice, certain requirements are necessary. Practitioners should consult a qualified teacher of Tibetan Buddhism. The description here is not to be used for meditation.